Hi there, Elena here with a quick and easy carnival toppers card set. When paired with carnival cupcakes and their matching dies, it's a snap to create a gift set, or just a slew of birthday cards to have on hand for last minute parties. I'm so sorry I didn't take extra pictures, but I was literally out the door to hand-deliver these as a birthday present to a friend. keep to a color scheme: I kept mine loose but still cohesive in pinks, light blues, and browns. 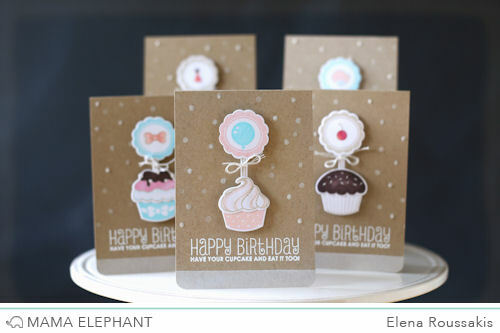 keep the same design on each card: a cupcake, its topper, a bit of twine, some confetti dots and sprinkles, the same sentiment and a swipe of white ink along the bottom. package it pretty: I put these into a clear card box and finished it off with a gorgeous ribbon. Such a cute card set! And great tips too! TFS! Love it...thanks for all the tips! Very cute. I bet the person you gave them to loved them. Such a lovely project, Elena! Thanks so much for the tips, too!